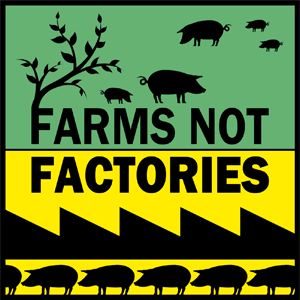 London, England: ‘Farms Not Factories’ – Please Sign and Take The Pig Pledge Today. TAKE the PIG PLEDGE Now !! It’s World Food Day 2014 and this year we’re focusing on family farming! Agribusiness corporations, solely motivated by profit, continue to take control of local food systems while more than a billion people in the world suffer from hunger and starvation, and another billion are overweight or obese. We think people should be able to define their own food and farming policies. By taking and sharing the Pig Pledge you will be supporting local and sustainable food systems. Please help spread the message to encourage people to pledge to eat meat from real farms, not animal factories. We have been engaging in online activities all week focusing on the various issues associated with factory farming. So far over 1,600 people have taken the pig pledge and we’ve had the backing of many organisations and celebrities, including Greenpeace, Stephen Fry and Hugh Fearnley-Whittingstall. Check out our website an twitter feed and get involved in the conversation! Please sign and share the Pig Pledge to inspire people to make better food choices that support socially and economically just farming systems.